With great pleasure, we present the work of five talented American artists whose work will be on view in Lodz, Poland all summer at what is probably the most important international exhibit of large-scale fiber art --- the 10TH ANNUAL TRIENNIAL OF TAPESTRY. Two tapestry weavers, one quilter, one basket maker and one who made a dyed mixed-media work will be among more than 150 artists residing in 55 countries around the globe exhibiting in the Triennial. 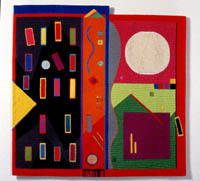 Helga Berry, who lives in Alaska, is known for bold, bright graphics in her abstract tapestries. 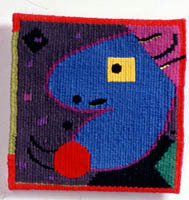 A mover and shaker in the field of contemporary work in the traditional medium of weft-faced weaving, Berry was co-founder of the International Tapestry Network. 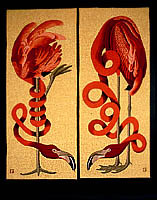 Mary Giles is widely known for her objects using the basketry technique of coiling. For the Triennial she made seven totems of figures embellished with metallic "petals." She resides in Missouri and has devoted full-time to her art since her retirement from teaching elementary school. Robert Hillestad has delved into several textile techniques including kitting fabulous coats. For the Triennial he made a labyrinthine assemblage of silk covered tubes that he dyed in a delicious range of colors. Hillestad taught art at the University of Nebraska in Lincoln. Joan Lintault, the third teacher-retiree in this group, moved to New York from Carbondale, Illinois, where she was on the faculty of Southern Illinois University. 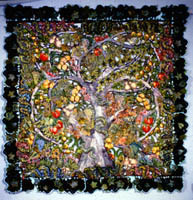 Her wall hangings depict a congested world of flora and fauna, as in the tree of life featured in the Triennial. 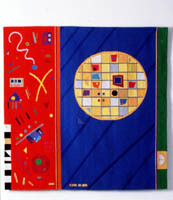 Nominally quilts, her works have an unusual and complex feature of openwork spaces between quilted images. 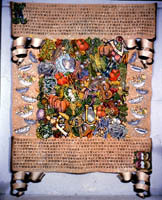 She was awarded the Bronze Medal at the Triennial for her work, "Uncoiling Snakes, 1998. For decades, Georgian Jon Eric Riis has been weaving tapestries with a present-day twist on theme or technique. He recently become interested in classical sculpture which he mischievously alters with contemporary embellishments. Riis was cited as an important American "emerging artist" by Art & Antiques Magazine, December, 1999, and has won Honorable Mention for his work, "Blondes, Brunettes and Redheads," 1998, in Lodz. An illustrated bilingual (Polish and English) catalogue of all works invited to the Triennial will be available from Friends of Fiber Art International. Call or fax (708) 246-9466 for information on how you may obtain a copy. 58" x 46" x 2.5"
39" x 46" x 1"